This week, please welcome Devin! Right before attending Devin's birthday party, I asked him what he might want as a gift. Well, to my delight, he told me he wanted this book! I asked Devin to join us for this week's K10 because I was curious what would prompt him to ask for this book for his birthday. My first name is Devin, I am 12 years old and my favorite ice cream flavor is strawberry. 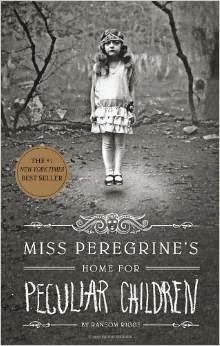 I read Miss Peregrine's Home for Peculiar Children. I chose this book because the cover and the title were interesting. When Jacob, Emma and the others were trying to rescue Miss Peregrine and Miss Avocet from Dr. Golan. I would try and help the peculiar children, like Jake, because I would have been the one that put them in danger. I think you would like it, it's really good, and has a lot of action. I think it is creepy but also interesting. I would, because these characters have a lot more to them, and I would like to learn more about them. I cannot, because this book is not like anything I have ever read. Where did he get the pictures from? Some of the black-and-white snapshots that pepper its pages are Mr. Riggs’s own; some are borrowed from collectors like Robert E. Jackson, whose pictures were exhibited in “The Art of the American Snapshot, 1888-1978,” a 2007 show at the National Gallery of Art in Washington. Click here to read the full article and learn more about what inspired Ransom Riggs to write this book. Devin is way braver then me, I still haven't been able to pick this one up to read. That cover is way creepy.